Well, with so many books out to choose from, readers have to have some kind of rough and ready way of filtering – some days I feel I spend more time selecting possible reads than actually reading!! One of my filters is that I generally avoid titles with the word “sweet” or ones where it figures large in the description, so I would have passed on this if author Susan hadn’t brought it to my attention. That would be a shame as its a wonderful read, even though I’d not read books one and two – one day…they sound just as fun as this one, so I’d like to read them. For me knowing the ending doesn’t spoil a story and I often reread old favourites. Why avoid Sweet though? Well, to me it conjures up those somewhat sickly and rather chaste 70’s Mills and Boon reads, the Barbara Cartland style of romance where ingenuous virgins rule, all is cute and tidy, nothing the slightest bit controversial, and everything remotely sexual is simply alluded to and stops at the bedroom door. Great for others – M&B sell millions so clearly people love that, but its not my taste. Here though its far from that, a story with divorced families, with problem exes, with ladies in their fifties and over looking for men, trying out internet dating, and some terrific Fun. 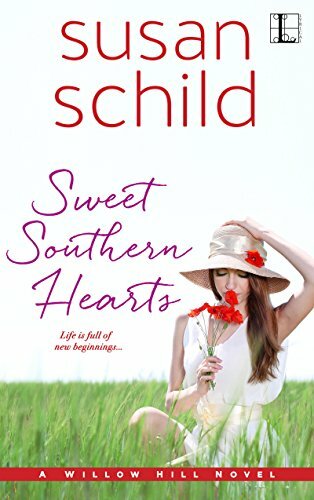 That theme pervaded the novel, kept me sniggering – the Sturgis festival where the ladies are on their RV tour of USA and think they’re going to a country craft fair and end up at a massive bikers convention, looking for Gourd birdhouses and the like – that was wonderful and felt so very real. Still, I’m getting ahead, Linny and Jack are on their honeymoon and a few days in are having a wonderful time…til the problem ex rears her perfectly coiffed head, rows with her new husband, and Jacks son Neale phones really upset at all the drama. Cut short the honeymoon and return home. Neale is a typical teen, and sometimes he seems OK to Linny, sometimes he even seems to like her, but other times its all how his mum would have done something better…Linny’s been reading step parenting handbooks and asking her friends for help – and what a fab group they are. They each are gems in their own right and play a solid part in the story. Then there’s Jack’s parents, off on a cruise but a great pair. They liked the ex, and are trying hard to make Linny welcome but she never feels she quite lives up to their view of how perfectly she did everything. Linny’s mum, Dottie and her friends – they were wonderful. I’d love to be one of them. Dottie won some money on the slots when the group went on a cruise, and she’s hired an RV for them all to go adventuring and sightseeing. Boy do they have some great adventures too, and I really felt there along with them. Its a story played out in many homes, divided families, divorces, new families and step parents, and all the issues that follow. I loved Linny, she was trying so hard with her new family, but she’s a business woman too, runs her own fledgling consultancy, and just is not a domestic goddess. Meals from Gus’s Gas and Go feature large in her repertoire. She’s had a tough time, widowed twice, with the last one being a real scumbag who left her with lots of debts. Now she’s got a chance of happiness with Jack, but of course his son Neale is 12, and any parent knows that’s coming up to the danger zone of teenagers, when we’re always in the wrong, and don’t understand, where they always feel put on, hard done by, taken advantage of….Poor Linny. She’s growing her new business and needs time to focus, but she’s running the home too, coping with Neale living there for a while as the ex sorts out her marriage issues, and that plus putting up with the ex ringing Jack constantly over stupid things all take their toll. It doesn’t help that Neale’s mum is one of those petite, gorgeous, glamorous mums, and though she knows Jack loves her she doesn’t feel she can let him see how insecure that makes her. Linny’s friends too were a fabulous bunch, and Diamond – what a marvellous woman, I adored her. There’s stories potentially from all these characters, they’re such a well fleshed out, diverse bunch, felt so real that it was as if they were my friends too. I laughed a lot in this book, not snort out loud humour but smiles and sniggers. I felt the problems, Chantel with her workforce, Linny’s sister Kate, struggling with a new born ( its not all Johnson’s baby powder and sweet smiling babies – more-scent-of-the-day-sick, with spit upon clothes, and crying babies where you don’t have a clue what their problem is). The whole story just felt so real, I don’t know if small town US really does fit this mould any more than small village UK is full of thatched houses, fundraising cake sales, and well meaning locals. It felt real though and I went along for the ride, imaging I was there and sharing how the story played out. I’ve rambled in far more than I intended but its a story with so much to offer, so much diversity that I wanted to try to say all the things I loved about it. Stars: Five, one to keep, to read when I want a solid story, great writing and to smile a lot!